I think it is fair to say that this past month has been the single most stressful of my career, and that of Mr. B. And so, I am very thankful to have rediscovered my Mellow Mummy status this month with thanks to the inspiration from the #31days2015 campaign and #ThePlayfulParent, a very mellow parenting approach by Julia Deering, author of The Playful Parent. You can find out more about the #31Days2015 campaign on twitter or tumblr. There is one overriding lesson I have learned from The Playful Parent, and that is to plan. I think my "Mellow" approach to parenting had ruled out "planning" as an option, favouring a re-active approach to parenting. But, having read through Julia's book, I can see that I have all of the skills of play with my two girls already, I just need to be well prepared to deploy my skills when the girls need me. It isn't any use knowing how to make 101 creative craft activities if you don't have the materials on hand to make them. It isn't any use knowing that (a) a kitchen colander and (b) coloured pipe cleaners can make the simplest of toys if you have neither a nor b available. I've made an effort this month to plan my evenings and weekends to make sure that I have a few fun activities already pre-prepped and ready for action. And yes, i think it has made a difference. This weekend was the ultimate test. Mr. B. was away for much of the weekend so I was in charge of girls, and food, and fun. Because Mr. B. and I share so much of the time at home, it always seems to tip the balance disproportionately when one or other of us is away. But this weekend was unlike most. It was calm, and fun. We made pink and orange cupcakes. We played "shops". We read books together. We made shrinkie dinks. We coloured in pictures of barns. We swept leaves. We played "cars". And most of all, we danced. I can't actually remember a weekend with less shouting of "Noooooooo". This makes me happy. At the end of The Playful Parent there is a little chart as an example of how to plan out your days, very much like I would expect the nursery workers at Holly's nursery to have to fill out ahead of each week. I don't think I'll go as far as drawing up a chart (maybe I would if I were home alone with Holly during the weekdays?) but it certainly does help me to have an idea of two to four fun activities that I can have ready for when I need them. The final chapter in The Playful Parent is about sanity savers. The chapter started with an explanation of some of the science behind why toddlers and young children behave "badly", especially for their parents. It does help to remind yourself of the emotional and physical changes and learning that is taking place in your toddler's body. I think I'm guilty of expecting too much from Holly, as a little sister. At present, I feel more confident about "managing" her "bad" behaviour and helping to calm her down by ensuring that she always has lots of play opportunities at home. 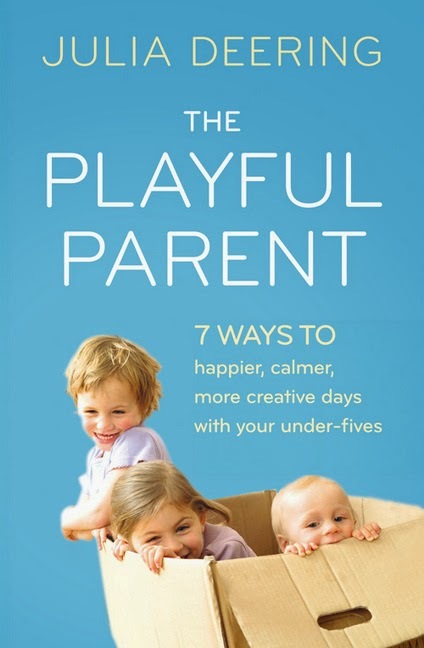 You can find out more about The Playful Parent on Julia's website and the Harper Collins website.